Rohan Sippy’s latest film, Nautanki Saala, set to release on April 12, has Kunal Roy Kapur and Ayushmann Khurrana in the lead roles with the film set with in backdrop of a theatre troupe. The director’s films are always punctuated with inventive and thrilling music, which adds to the stylish picturisation and often advances the narrative. Sippy has a real finesse for using songs as emotional connecting points to develop the humour, pathos, and yearning of the story. With Bluffmaster, Do aur Do Paanch played against the planning of the heist, and ‘Jiyein Kyun’ in Dum Maaro Dum underscored the pain of its trapped protagonists. 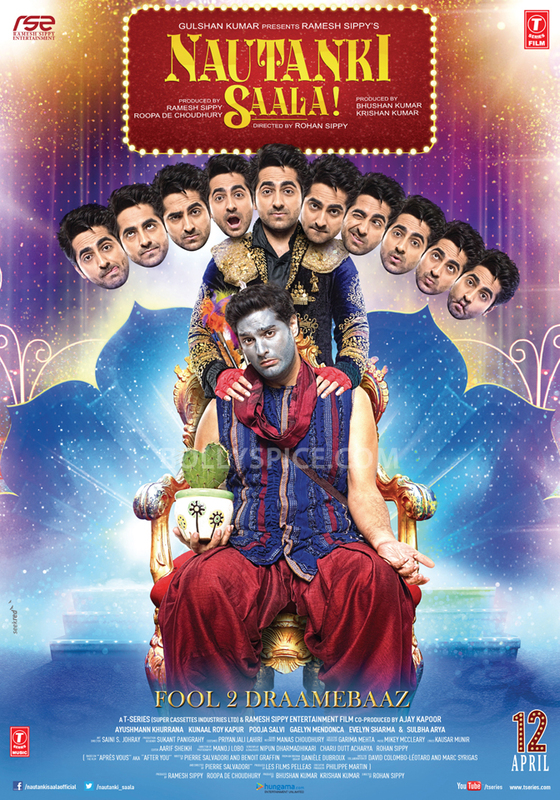 Nautanki Saala features music by Mickey McCleary, Falak Shabir, Rashid Khan, Ayushmann and Rochak Kohli. Sippy worked closely with McCleary to achieve that confluence of music to match the material, as he says in a blog post, “There is a great scope for lyrically strong, languid or mid tempo tunes. It may be fun to get in some gentle old school ska and reggae (maybe country too) influences too, keeping the vibe warm and sunny.” The result of all this collaboration is one of the most joyous and cheery albums that is consistently layered and addictive. From the opening ukulele strums and peppery accordion notes, Mera Naam Kehne Laga, is a complete dream of a song. The tune has a whopping 4 versions, so it’s a treat to pick and choose your favourite one. The original is sung and composed by Pakistani sensation Falak Shabir, whose song ‘Saajna’ from I, Me, aur Main definitely made it on my top-played list this past week. Add this one to the pile, since Shabir has such gorgeous vocals that takes you across this lilting ballad. The lyrics by Shabir are simple and serene, and hark back to the old-school ballads that conveyed all that yearning and thrill of love. The tune is dreamy with its soft arrangements that have you immediately swaying and humming along to Shabir’s confection. The bridge particularly utilizes more of that calypso sound that McCleary is famous for, and these varied influences never get too chaotic. Guaranteed this lovely melody will end up on your most-played list by the end of the week. The song comes with the Reprise Version, which slows down the tempo and makes this a minimalist gem. While you might miss the exceptional arrangements, Shabir utilizes more drum kicks, acoustic guitar, and a graceful piano theme that runs throughout. With this variant, you can admire Shabir’s technical dexterity as the arrangements are to die for, and just wonderful. We get the Female Version, with Tulsi Kumar at the helm who unfortunately sounds out of her depth with this track. Kumar sounds fine, but rather on the shrill side and misses all the nuances and emotion of Shabir’s one. Skip this one perhaps. Even the Remix Version, is another example of how to do a remix the right way. It keeps the innate dreamy quality and updates it with a trance style with spaced out electronic beats that might have you swaying along as much at the original. The beats are similar to the “Don’t Believe the Levels” track by Avicii but this one keeps the orchestral moments of the song, which makes for a cool contrast. Rochak Kohli and Ayushmann Khurrana reunite for Saadi Galli Aaja, another gem in the same vein as their chartbuster ‘Pani Da Rang’. Neeti Mohan begins the track with her quivering voice that charms you right away and shows us a tender side to her voice after the energetic ‘Jiya Re’. Mohan has such versatility and this song aptly showcases her talent in her small verses. However, Khurrana proves he’s not a one-trick pony, as he’s got such emotion and verve in his voice. He reaches the high notes with aplomb and has a crackling chemistry with Mohan on this track. Kohli keeps the arrangements addictive like their previous hit with the splendid guitar, soft drum kicks, and affecting vocals. It’s a resoundingly lovely song with brilliant Punjabi lyrics by Kausar Munir that speak to the initial buzz of being in love and courtship. The bridge that comes two minutes is a perfect moment as the cascading guitars complement Mohan’s alaaps and Khurrana’s supple vocals. It’s up there with ‘Pani Da Rang’, because Kohli and Khurrana use their basic template and create something wonderful from that fruitful collaboration. The Unplugged Version is simply resplendent with its exceptional arrangements by Kohli who adopts McCleary’s style into this track. From the melodica, piano, and mandolin melody that lines the track, Kohli gives the musicians space to have solos and work perfectly in sync with the singers. There is just so much to love on this version as it just sweeps you away with these softer vocals from Mohan and Khurrana who imbue more emotion and chemistry than the original. The verses are quite different and allow for more interplay between the singers and musicians during the bridge. Khurrana and Mohan are dreamy in all of their yearning and sultry glory. Keep this on repeat. We get another Remix Version that works with the faster tempo and adds the trance layer to the track. It sounds great but loses some of that emotion and melody amidst the chockablock beats that come thick and fast. Take your pick out these three. A Rohan Sippy film would be incomplete without an updated retro track, this time it is the Dhak Dhak Karne Laga, from Beta. Now this track already has its place in cinema history as one of Madhuri’s most iconic songs and display of her emotive dancing, which makes this update a dicey proposition. However, McCleary showcases his finesse for remaking old tracks and infusing it with an enticing energy and joy. The song would be right at home on one of his Bartender albums, because he’s got a brilliant singer in Saba Azad. Azad captures the naughty spirit of the song in purring out her verses and drawling on the key lines. Azad’s husky voice is perfect here, as she succeeds in keeping the fun and sexiness of the original track. Her supporting male chorus of Geet Sagar, Bruno Carvalho, and Santosh Sawant chime in at the opportune times and lend some able support. McCleary makes this a masterful tune, with the faster tempo that makes you want to rush to the nearest dancefloor. It’s an enthrallingly good song with the paced out loops of flutes, thumping drums, and the melodica again. While it may upset purists, it is a cheeky and charming track that deserves multiple listens. Next up is the stunning Tu Hi Tu, which pushes Ayushmann Khurrana outside his comfort zone with a subtle and romantic track like this. McCleary ensures that the sweeping melody of the swirling violins and the darbuka drum beats become the heartbeat of the track and instantly get you swaying. The song achieves that almost vaudeville sound with its old-school elements and crescendos of the orchestra midway through the track, which works brilliantly with the theatre setting of the film. The trumpet solo by Kishore Soda interacts soulfully with the violin and cello sections by Rachel Golub and Duke Mushroom of the Sounds of Mushroom that was recorded in NYC. That essence of collaboration is just infectiously enjoyable in this track with its layered appeal with much to savour. Khurrana is emerging here as a competent and expressive singer whose evocative vocals convey all that passion in Kausar Munir’s succinct and poetic lyrics. He has the right timbre and does not hog the limelight in this track, and lets the musicians shine with their solos and timbre. After four standout tracks, we get the equally energetic situational song, Dramebaaz, that captures the philosophy of the theatre troupe and their lives. The lyrics are hilarious and evoke a lot of mirth and fun so I cannot wait to see how it is picturized onscreen. McCleary often utilizes Calypso, Carnival influences which is apparent from the steel drums, and enthusiastic trombones that lace the track. Geet Sagar, the X-Factor winner, is positively gleeful and spirited on this track, clearly having fun with the witty verses. The later portions of the song embrace that carnival sound as the trumpets, steel drums, and orchestra swells to gorgeous conclusion. Keep this one on repeat. Rahat Fateh Ali Khan’s songs have often flowed into one another, with one ‘Saiyaan’ sounding like another with his familiar alaaps and screeching. Thankfully, Rashid Khan knows how to harness Rahat’s misplaced energies in Sapna Mera Toota, as this subtle tune recalls the earlier songs where we fell for his vocal dexterity. It helps that Aftab and Hashim Sabri’s qawalli verses makes this a standout track, and they lend amiable support to Rahat throughout. The dholak and tablas during these portions add some authenticity and energy to the track. Rahat is emotive and proves his detractors wrong. Rahat evokes the pathos and loneliness of Munir’s lyrics so superbly that you cannot help but admire and appreciate Rashid Khan’s effort. Saba Azad is back with the quirky Dil Ki Toh Lag Gayi, that makes me want to hear more from her as she’s imbues the track with such fervent energy and personality. Rohan Sippy mentioned that this was the first track that they worked on, and it had to convey that “atmosphere and camaraderie behind the scenes” and the celebrates the alluring and charming woman that the heroes are after. It certainly complements the slow-burning jazz melody that McCleary crafts with his zippy accordions, lilting mandolins, and trumpets that work in perfect harmony. Azad is simply exceptional here as she really gets the emotions right and drawls on the witty lines like, “Cinema ki hai tu aag, Mogambo khush huaa Dil ki toh lag gayi…” Azad gives the song it’s witty and vivacious with her giggles and control of the material. Give this one a try. We end this album with one of the best remixes ever, So Gaya Yeh Jahaan, sung by Nitin Mukesh for the film Tezaab. I immediately loved that McCleary threw in a bit of surf guitar to pair with the crazy trumpets, rapid drum claps, and spacey electronic beats. It’s a brilliant update of an already great track, and McCleary’s tributes always retain the original flavour but injects it with some much-needed peppiness and fun. This song is immensely enjoyable and is a great example of how to update a hit song faithfully. Nautanki Saala is definitely one of my favourite albums of the year, because of McCleary and his conspirators’ commitment to producing tracks that are layered and versatile. The album is inventive and endlessly enjoyable with songs to savour and swoon along to. 15 queries in 0.687 seconds.